Top salespeople don’t just have meetings; they are mentally prepared for meetings. Just as you would make sure you have the demo, the samples, the PowerPoint or brochures as well as the product video all keyed up on the tablet, top salespeople also take the time to prepare mentally. Are you mentally prepared for your next sales meeting? Here are 4 key attributes of mentally prepared sales professionals. 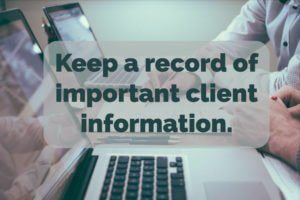 Top sales professionals keep a great record of their clients and their information. They have the names of their clients’ spouses, information about their passions, hobbies, and the industry they are selling into. Mental preparation for sales presentations and meetings are a part of mental discipline. It is often not boring or a lot of memorization if sales reps are genuine and authentic. Get into a problem-solving mindset rather than sales mode with clients. Mentally prepared sales professionals consider the information on the client already known, what would be helpful to know in this meeting, and how the product or service offers value. In this way, mental preparation is a lot like putting together a jigsaw puzzle. In going over current information, the mentally prepared sales professionals may find missing pieces. 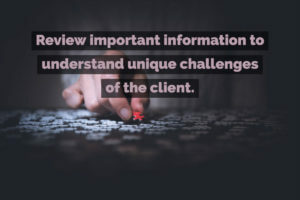 Reviewing client information provides a framework for details and data for the sales rep. This is vital to understanding the story and challenges that the customer is facing. By discovering these details in authentic and genuine conversations, the product or service becomes the solution rather than just a part of the puzzle. It is very common for a sales professional to find a method of selling which works very well with one client. 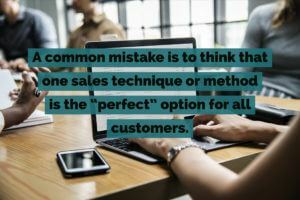 A common mistake is to develop a thought that this sales technique or method is the “perfect” option for all customers. Customers are very different. This difference extends even to companies within the same industry. What works as a solution for one company may not be needed or effective in another company. Locking into a mindset of one sales solution for all customers is not only self-limiting, but it is likely to be self-destructive. A better option is to maintain an open mindset about trying new things. This also goes back to not taking rejection personally. In some cases, the deal-breaker may be the approach that was used. Experimenting with different approaches and methods differently will keep the sales professional focused on the buying signals sent by the client. For example, one customer may want to spend 10 or 15 minutes sharing personal stories and getting to know you as an individual. Another client may want to talk about the problems they are experiencing, and a third client may want to include a team approach to making a purchasing decision. Some customers may want information emailed while others will want to hear your presentation at the meeting. Understanding each customer will impact how you structure and plan your time with the customer. 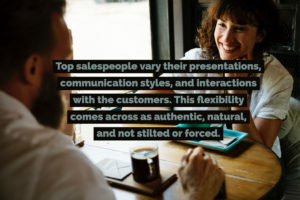 By being flexible and carefully discerning what approach is best for the client, top salespeople vary their presentations, communication styles, and interactions with the customers. This flexibility comes across as authentic, natural, and not stilted or forced. It also gives you additional ideas for how to be comfortable in trying new approaches with future customers. Not being rigid also allows the successful sales rep to quickly read a customer and adjust their style in the first few minutes of a meeting. Challenging yourself to meet the best style for working with a customer is a great mindset for success and one which will have an immediate positive impact on any meeting. If you would like to learn more about the attributes of mentally prepared sales professionals, sign up for The Sales Coaching Institute newsletter to learn more!